As The Bitcoin Short Quietly Grows, Is A Short Squeeze Imminent? Two weeks ago, when bitcoin was trading in the $15,000 range, we published what in retrospect was a warning to bitcoin investors, highlighting that traders of bitcoin futures appeared to be quietly building a net short position. As we reported on Jan. 7, CFTC data for leveraged funds - which consists largely of hedge funds and various money managers - showed a short of around $14mm, or around a quarter of the total open interest. "In other words", we summarized, "spec investors have used the futures contracts to establish Bitcoin shorts." Just a few days later, following what in retrospect appears to have been overblown and misinterpreted news out of South Korea that the country was preparing a bill to ban bitcoin exchanges, something it has since denied (for now, at least), as well as frayed nerves after the shuttering of the allegedly fraudulent crypto-exchange platform BitConnect, those bitcoin shorts were generously rewarded, generating profits as much as 40% when bitcoin tumbled to a low of $9000 last week, before rebounding modestly since. To be sure, the decline in prices across the crypto space last week was broad-based, with the aggregate market capitalization of cryptocurrencies declining by around 35% from a peak of around $800bn on Jan 6 to around $520bn on Jan 16. 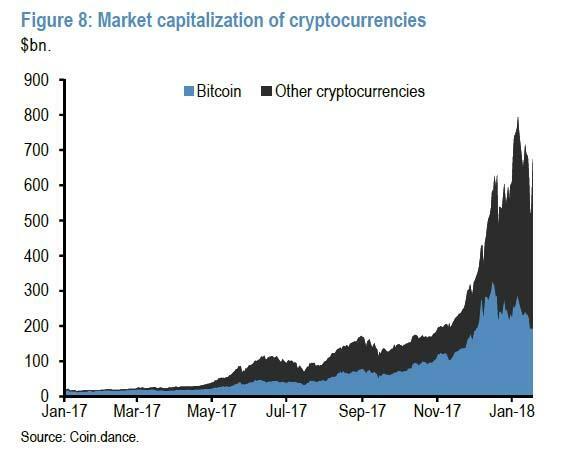 Cryptocurrencies eventually recovered on Jan 18 although the the recovery in Bitcoin was more modest, leading to a decline in the Bitcoin share of the total cryptocurrency market cap to below 30% for the first time. 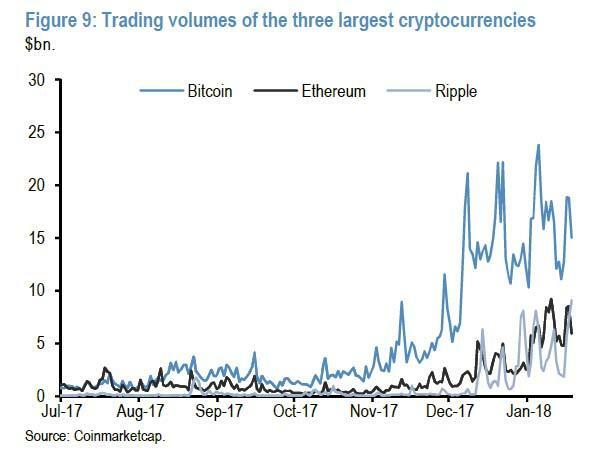 And while some had already written off bitcoin futures barely a month after their launch due to lack of volume and trader participation, the recent sharp movements in crypto prices saw a rebound in trading volumes across the three largest cryptocurrencies, as the next chart from JPMorgan shows. 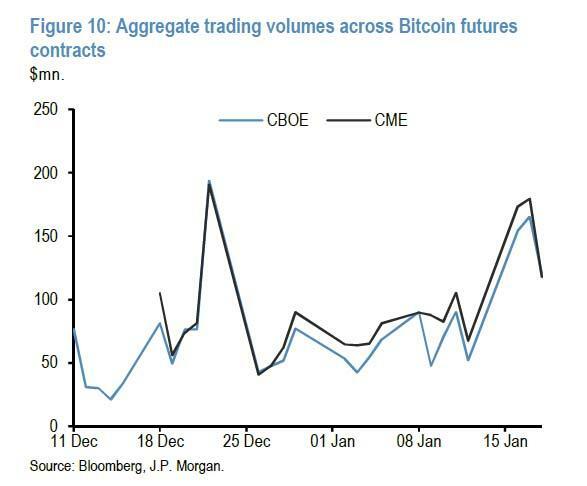 Trading volumes in Bitcoin futures on both the CME and CBOE also rose significantly, to $180mn and $165mn, respectively, approaching the highs of around $190mn on Dec 23, compared to average daily volumes of around $80mn and $70mn respectively between these two peaks. While volumes picked up, overall participation in the futs markets remained shallow, with open interest on the CME at around $80-90mn, broadly consistent with its average since the start of the year. 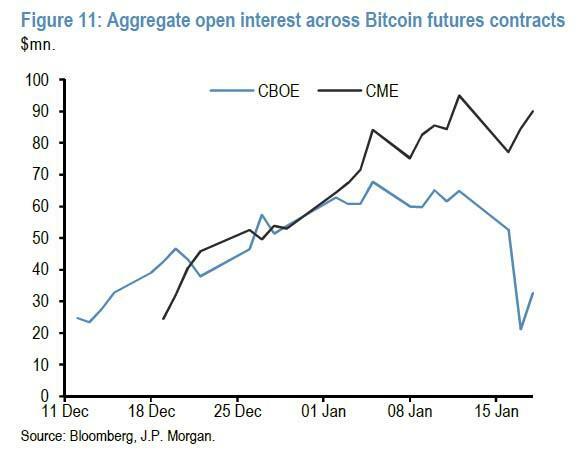 By contrast, CBOE contracts saw a significant decline in open interest to $20mn compared to its average of around $60mn this year, though this was likely related to the expiry of the CBOE January contract on Jan 17 than the sell-off in cryptocurrencies more broadly on the previous day. The fact that less than half of the open interest from the January contract was rolled into subsequent contracts is also suggestive of the CBOE futures contracts at least thus far having been used to establish short-term speculative positions. Finally a look at net positioning, which reveals that the trend first highlighted two weeks ago has accelerated, with recent CFTC data showing that the net short positions held by non-commercial positions was nearly $30mn as of Jan 9, or around 40% of open interest. This "push" by shorts only extended in the subsequent week ending January 16 as bitcoin suffered its worst crash in years. The continued press by shorts is shown in the chart below, which while only allowing for 5 weeks of data, demonstrates that bitcoin shorts are clearly becoming more aggressive by the week. And with the short overhang growing weekly, one wonders how long before a short squeeze - whether due to some long-overdue bullish catalyst or for some other reason - in unleashed first in bitcoin futures, then quickly cascading into the spot market, potentially unleashing the next move higher in the cryptocurrency space.